May 1st is Law Day and is being marked by a number of events across Wisconsin. Do you have plans for Law Day? "This year’s theme recognizes the inextricable link between freedom and equality, the importance of living up the promise of equality under the law enshrined in our nation’s founding documents, and the challenges that remain in realizing that ideal." Information for teachers and students can be found on the ABA website. 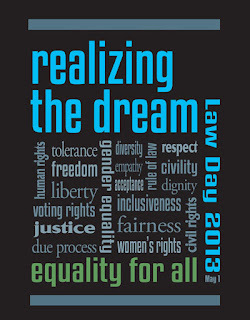 For more information and links to additional resources, visit the ABA Law Day 2013 page. 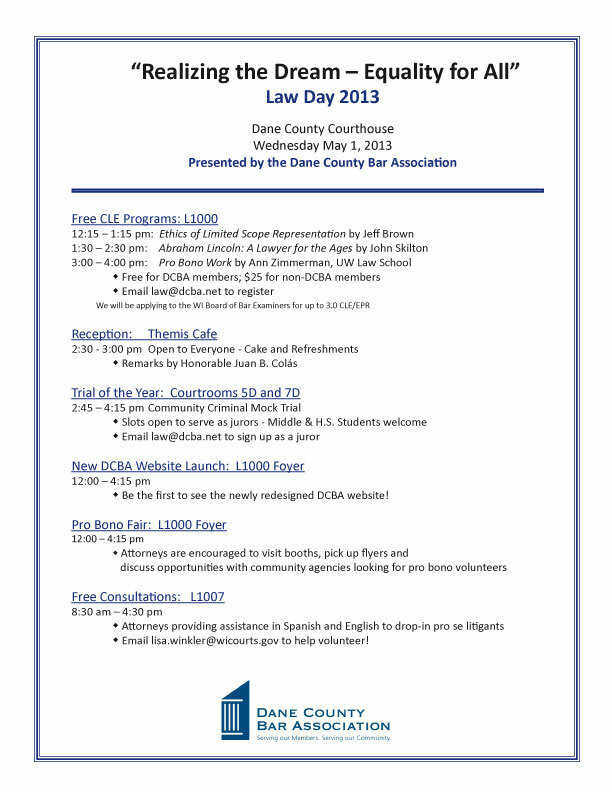 On Wednesday, May 1st, the Dane County Bar Association (DCBA) is putting on a day of programming at the Dane County Courthouse. Events include 3 free CLE programs, a Pro Bono Fair, a demo of the DCBA's new website, and mock trials. The full agenda can be viewed by clicking on the image below. 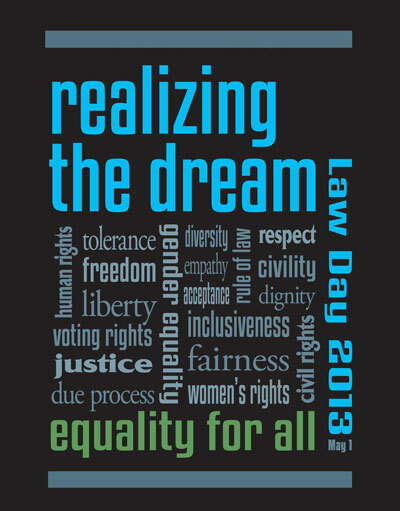 The Milwaukee Bar Association is celebrating law day on Saturday, May 4th. 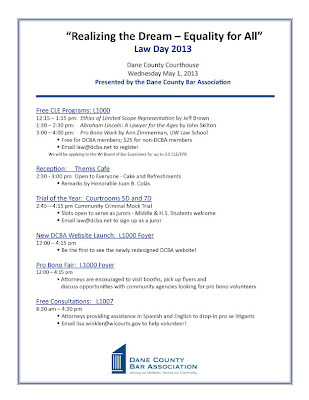 More information and locations can be found on their law day flyer. This week is National Park Week - that wonderful week when admission to national parks is free! Even if you don't have plans to travel out to any of our 401 national parks, you can be an armchair tourist through the National Park Service website. I did my own armchair tour of the Apostle Islands National Lakeshore. The official page has all the travel information and photos you could want. However, for a more personal and timely touch, I recommend visiting the Apostle Islands National Lakeshore Facebook page. Here you can look at current pictures and videos - and even read a poem! The Gaylord A. Nelson Apostle Islands National Lakeshore Wilderness Act can be read online, as part of Public Law 108-447. You can also read the current law for the Apostle Islands National Lakeshore online. The 2013 theme for Earth Day is the face of climate change. How do you plan to celebrate? If research is on your agenda, head to our Environmental Law page for links to a number of agencies and guides relevant to environmental law. Green building and LEED certification information. A survey of information, including natural resources, toxic and hazardous waste, GMO, and administrative and judicial decisions. Cleanup and sale of contaminated property. Includes a chapter guiding researchers on environmental law and land use planning. Private and public water rights, environmental controls, and agreements and laws ranging from local to international. A list of other books in our collection related to environmental concerns. 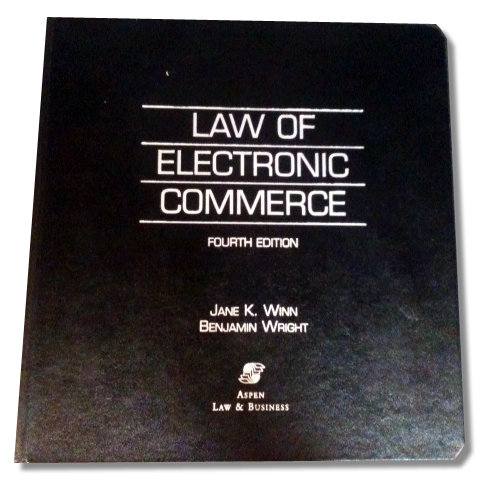 As the volume of trade accomplished through electronic means continues to skyrocket, this area of the law is also developing and evolving at a staggering rate. To help practitioners keep pace with new cases, statutes, regulations, proposals, commentaries, and model laws, authors Jane Kaufman Winn and Benjamin Wright provide guidance on the implications of communications technology for both consumer and commercial transactions, as well as in the workplace. Corporate E-mail Archives: Unwanted Liability or Searchable Asset? Get the scoop on our National Library Week events in our latest newsletter, now online. We announce a new mid-April CLE class, highlight updated and useful legal research books, and talk about our new in-library WestlawNext access. BadgerLink databases, like Academic Search Premier and Newspaper Source Plus, may be unavailable between Sunday (4/7) at 5 p.m. and Monday (4/8) at 4 a.m. During this time, scheduled server maintenance may make databases unavailable for one to two hours. This maintenance will not affect access to the Hein Online Law Journal Library or LegalTrac. For a list of all databases available with your library card, see our Articles & Journals page. "Shakespeare's Hamlet uses it to mean something compact when he says, 'I could be bounded in a nutshell, and count myself a king of infinite space, were it not that I have bad dreams'." At the law library, we're very used to seeing this idiom in the context of the the popular Nutshell series. Nutshells are intended to provide a short summary of the law and pertinent resources on particular topic areas. Don't miss election day on Tuesday, April 2. The offices of Supreme Court Justice and Superintendent of Public Instruction are on the ballot throughout the state. Locally, many areas are holding elections for local official and school board offices. Check MyVote.WI.gov to find your polling place location and to see a sample of your local ballot. Photo ID is currently not required to vote. Check the Government Accountability Board's website for more information about this month's election.